From beautiful friends, originally uploaded by indiaeden. How can I be so blessed in so many ways, unyet not have my precious baby Florence here with me? Today, a parcel came. I wasn't expecting anything and was confused by the return address, recognising the name as one of my friends from an online sewing group,I've been a part of for a looong time now. We've supported each other through many ups and downs of life over the past eight or so years. Some of us have met, and some of us haven't. Inside the box was a card with the message "A warm woolly hug from all of sns chatter", and the most beautiful blanket I've ever seen. I'm guessing my beautiful friends made a square or two each and then someone was nominated to sew them all together. I sat and cried and admired each square trying to guess who made each one. I'm so lucky to be part of such a lovely group. Thank you guys, I love you all. What a beautiful thoughtful gift from some great friends. I can only echo what Lucie said so beautifully! We hope that it gives you and your family some comfort and gives you a sense of how much love everyone has for you! It's just perfect. How lovely. Jeanette, I'm so pleased you love it - it meant a lot to me that we could make make something comforting and to express our love for you & your family. So pretty! What a sweet gift from wonderful friends. What a blessing. We were all feeling inadquate I think as there was nothing we could do to make things better for you, I know that I sat and thought of you and your family as I knit my squares and I'm sure all the others did too. Mine are the acrylic ones, sorry about that but I'm sure you understand why they're probably the only non-wool ones in there! Aren't cyber communities a truly wonderful thing! I would not have "known" you had it not been for the NM forum. That beautiful blanket will be a treasured family heirloom and a tangible memory of loving kindness that spans time and space. Lucie says so well what we are all thinking. 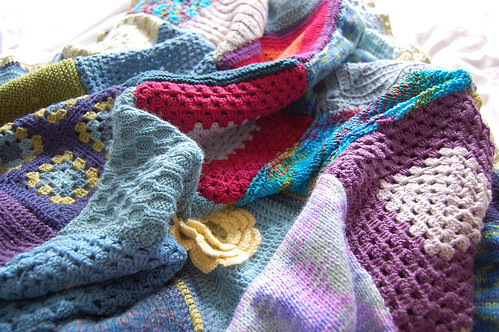 I knitted my squares on holiday, a time to reflect without the PC. I am so glad you love the blanket Jeanette, Caroline did a great job putting it together, it does look amazing! Frustrated Fairy, I've been trying to leave a comment on your blog for a couple of days,but can't get past your word verification thingy. I'm just hoping you come back here and read this. I wanted to send you love and let you know how sorry I was to read about your baby girl.